Back in June the Friends of Glemsford WI, led by Lesley Lagden, organised a Summer Ball and Hog Roast in Glemsford Village Hall. Sue De’Ath – a long-time volunteer with Kernos – suggested to the committee that the proceeds from the event could be donated towards helping Kernos to support local people who suffer from emotional and psychological problems. The Ball was a great success, with everyone who attended enjoying some great food and later dancing the night away to a superb band featuring “the golden sounds of Hazel Fleming, Steve ‘the singing barber’ Hendry and Lisa Porter”. As a result, the organisers recently visited Kernos (left) to present a (suitably large!) 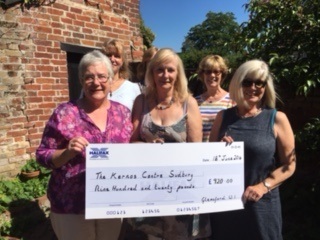 cheque for £920, which formally handed over – and was most gratefully received – in the courtyard garden at the Centre that was recently refurbished by members of Sudbury Round Table. This money will go towards part-funding around 50 treatment sessions for those of our clients who are unable to pay the full cost of their counselling.